Left temporal bone. Inner surface. Diagrammatic view of the fundus of the right internal acoustic meatus. The opening to the meatus is called the porus acusticus internus or internal acoustic opening. It is located inside the posterior cranial fossa of the skull, near the center of the posterior surface of the petrous part of the temporal bone. The size varies considerably. Its outer margins are smooth and rounded. The canal which comprises the internal auditory meatus is short (about 1 cm) and runs laterally into the bone. 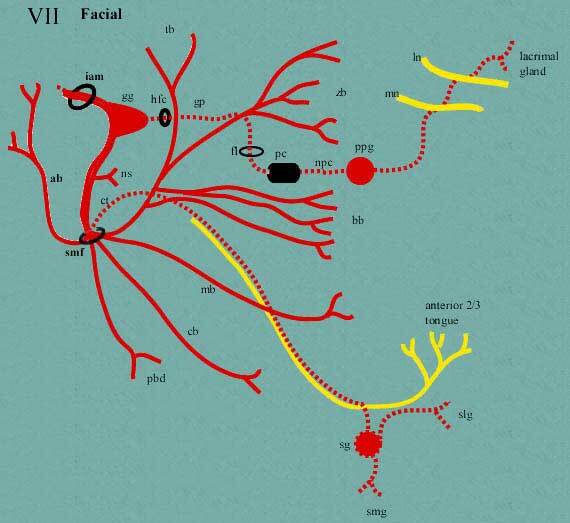 The cochlear and vestibular branches of cranial nerve VIII separate according to this schema and terminate in the inner ear. The facial nerve continues traveling through the facial canal, eventually exiting the skull at the stylomastoid foramen. The internal auditory meatus provides a passage through which the vestibulocochlear nerve (CN VIII), the facial nerve (CN VII), and the labyrinthine artery (an internal auditory branch of the anterior inferior cerebellar artery in 85% of people) can pass from inside the skull to structures of the inner ear and face. It also contains the vestibular ganglion. Temporal bone at birth. Inner aspect. ^ Kozerska, M; Skrzat, J (2015). "Anatomy of the fundus of the internal acoustic meatus — micro-computed tomography study". Folia Morphol. 74, 3: 352–358.